Gina Liberto sent me an email to introduce her small company Land-Rich that she recently opened together with her partner. Land-Rich is a refined shop based out of Brooklyn, New York. Their mission is to provide beautiful objects that symbolize the quality, functionality, and sustainability of simpler times. Each quarter Land-Rich will debut a new edition of products, all inspired by raw nature. These timeless items will then become a part of Land-Rich’s permanent collection. 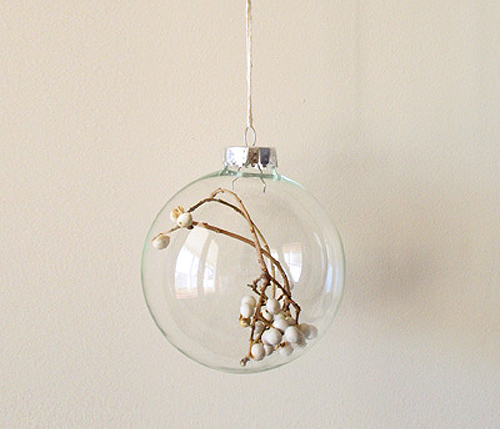 The first edition are these handmade, nature-inspired holiday bulbs, which can be purchased online. I just can’t get over how effortlessly elegant they look. Such a beautiful idea! These are amazing! I love this idea! There’s just something that appeals to me about nature under glass. It just emphasizes and draws attention to the beautiful details of the natural elements. What a lovely idea. 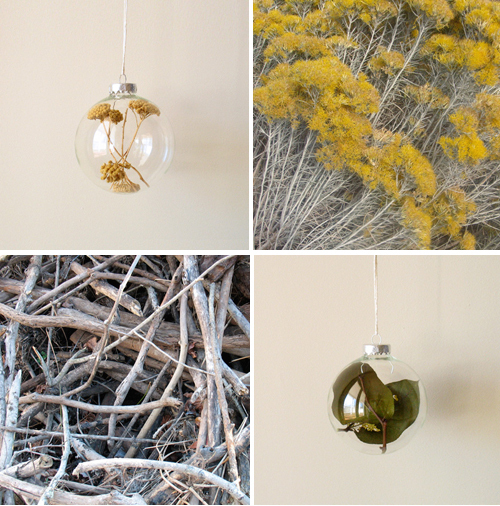 Seen so much of nature in christmas decorating this year, it’s already starting to feel a little old, but these are truly beautiful.